Every year of the decade I have spent here, the hottest days were in May through June and 2016 seems not to be an exception, unfortunately. It’s barely the middle of June and I can already feel a hint of Autumn in the air. Or am I just paranoid? Don’t get me wrong, I love living in Ireland. However, I am a bit sour about the Irish weather business at the moment. It’s because I (kind of) perfected my fermented drinks and have been very excited about writing a very cheerful post on how to quench your thirst. Well, I don’t know about you, but I don’t have much thirst to quench with 17 degrees Celcius outside. Anyway, I drink large amounts of kombucha, water kefir and ginger beer because I run regular workshops now and need to repopulate the cultures constantly. And, because, regardless the weather, I love them. You can read about kombucha and water kefir in my past posts, so today I will give you a bit of info about the ginger beer. 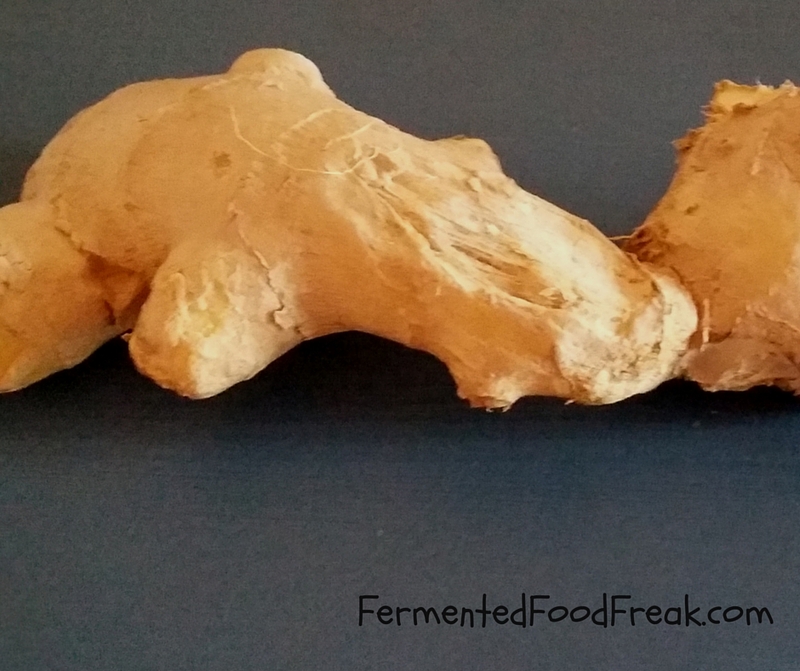 Ginger beer can be easily confused with other ginger stuff, so let me explain a bit. Ginger bug is naturally fermented sugar and ginger used as a starter for homemade sodas. It contains wild yeast that naturally grows on ginger if you let them, the same way as when you make a sourdough starter. Read a recipe on how to make ginger bug here. Ginger beer plant (GBP) is also a soda starter but you cannot make it at home, you have to get it from someone. GBP looks very similar to water kefir grains and is believed to have been passed from generation to generation by families in Crimea since very old times. It was first examined and described scientifically in 1892 when ginger beer became popular in Europe. The original GBP was stored in one of the German culture banks and some people purchased a sample when it was offered for sale*. They say this is the only source of the real thing in the world at the moment. There is a rumour that some online sellers offer ordinary water kefir grains as GBP. Like there was anything “ordinary” about water kefir, ha! Unfortunately, it is rather impossible to establish if your grains are proper GBP derived from a German bank sample unless you have a bit of lab equipment at home. Ginger beer is a fermented drink made with either ginger bug or GBP. It doesn’t contain alcohol unless you brew it for a prolonged time in the anaerobic conditions. Ginger ale is an artificially carbonated soft drink made with ginger. In its basic form, it is just a mixture of water, sugar, ginger and CO2. Sometimes people call ginger water kefir or ginger whey soda “homemade ginger ale”. In this case, it will be a fermented drink. Didn’t I say it’xs a bit confusing? Personally, I make ginger beer from ginger beer plant that I got from a credible source, so I believe it to be the proper German-Crimean thing . The taste of the drink is different than ginger water kefir and my plant grows much slower than the kefir grains, so I am not going to sent a sample for lab analysis (yet). Thank for reading and hope to see you back! *Update 01/07/2016: It wasn’t actually for sale. I have just found a website that reports the story how GBP was obtained from the German culture bank. Because the bank refused to release the culture to an entity other then a research or education institution, one of the members of an online forum wrote a letter pretending he is a researcher. As a result he got two test tubes containing eight grains that he repopulated. You can read the full story here. Previous Previous post: Should Fermented Food Be Refrigerated?